As soon as her name was bellowed through the loudspeaker at Preah Yukunthor High School in Phnom Penh on Saturday afternoon, Chea Anchhy began darting back and forth across the courtyard, tears streaming down her face. She had just received the news that she passed the national high school exit exam with a grade of D.
“I’ve never felt this way before,” the 19-year-old said as she alternated between wiping tears from her eyes and embracing a friend. Of the 93,752 students who sat the exam, Ms. Anchhy was am­ong the 55,753 students—or about 62 percent—who passed the test and are now eligible to attend university. After sweeping reforms went into effect in 2014 to eliminate an epidemic of bribery and cheating, the exam pass rate fell to 40 percent, and slightly improved to 56 percent last year. Those who fail the test can either try again the next year, change to vocational training or join the workforce without a high school degree. This year, 405 students earned an A by scoring 90 percent or higher—nearly four times last year’s 108 students, and well above the 11 who got a top mark in 2014. Among passing students this year, 2,801 received a B, 5,595 got a C, 8,835 passed with a D, and 38,117 students skimmed by with just under 40 percent for an E.
Having failed last year, Ms. Anchhy was still determined to pursue a career in the pharmaceutical industry. She hit the books 10 hours a day, seven days a week, she said, and often would skip meals so she wouldn’t break her concentration. Chea Reaksmey Kongkea, 16, arrived late for the result an­nouncements on Saturday, but also expressed disbelief when friends told him he had received a B grade. “The students should be congratulated,” he added. But for some exam-takers, the tears and shock resulted from with the news of failure. 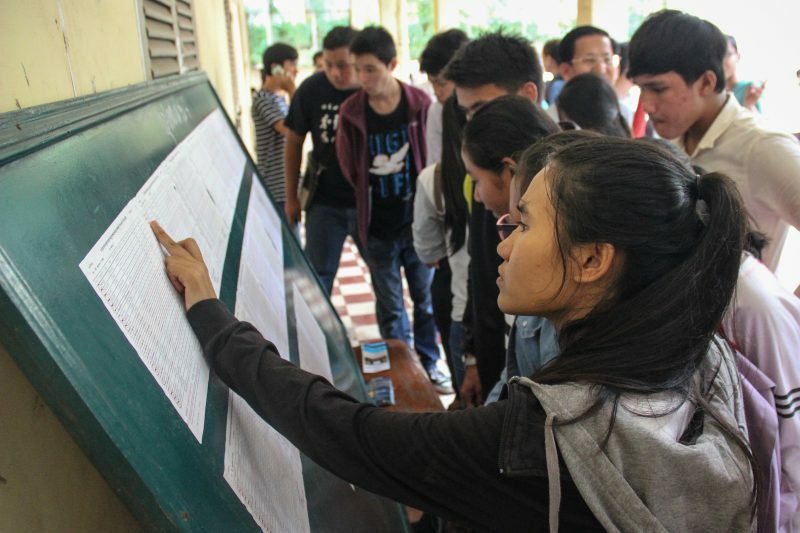 Even with passing rates rising, only the roughly 3,200 students who scored at least 80 percent on the exam this year would see much benefit, according to Long Botta, who heads the opposition CNRP’s education committee. The others “could not compete with foreign employees,” he said, adding that few students who passed the exam in the previous two years had been able to land jobs. He said that the quality of education, from primary to high school, was simply too low for graduates to meet international standards when competing for scholarships or jobs. Walking into the courtyard at Preah Yukunthor with a bag of fruit and handful of incense, however, 19-year-old Choub Dane said she was grateful for her passing E grade, and had come to thank the spirits who helped her achieve it. “Before the exam, I went to the spirit house under the tree to pray, and if I passed I said I would bring fruit for the spirit,” she said.